FROM TUNA TO TINSEL: Rena Owen is enjoying being back home in Moerewa. 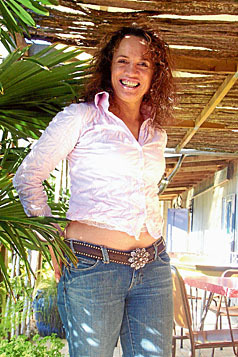 The Northern News caught up with Hollywood star, Rena Owen while she was visiting family in Moerewa last week. She may be a Maori girl from the sticks, but leading Kiwi actress Rena Owen is living her dream among the glitz and glamour of Hollywood. The actress, who first shot to fame in ‘Once Were Warriors’, is living smack in the middle of Hollywood in an area known as the Beverly Adjacent. Rubbing shoulders with the likes of Brad Pitt and Denzil Washington, while hanging out in night clubs where Paris Hilton is likely to be seen, it’s safe to say Rena has adapted to the Hollywood etiquette. Only two months ago she was hanging out with Aussie pal, Mel Gibson. But despite her star-studded lifestyle, this tuna town gal is as grounded as it comes. “The day I was to jump upon a pedestal, no sooner would my family knock me down,” she says while enjoying a bagel and latte at Moerewa’s Tuna Cafe. Rena attributes her ‘down to earth’ mannerisms to being a Kiwi and growing up with a solid upbringing from her parents. She is proud of her Maori culture and she celebrated Waitangi Day on a Los Angeles beach with other Kiwi celebrities living there, including Temuera Morrison and Martin Henderson. “New Zealanders retain a certain modesty. We have very different values to Americans, money doesn’t define who we are because we have culture,” she says. She describes America as an ‘occupational hazard’ but a massive learning centre, a place that has been essential for her to develop her career in writing and producing. Seven years ago she reluctantly left New Zealand after a gentle nudge from her mother. While in LA, she featured in movies including ‘Star Wars Episode 2’, ‘Attack of the Clones’, Steven Speilberg’s ‘A.I’ and ‘Soul Assassin’. But if it’s not love or money holding Rena back, next year she hopes to escape the LA scene to New Zealand where she owns a house overlooking Muriwai Beach and land at Otiria which she one day hopes to build on. Then all she would require is a ‘hunky Kiwi bloke’ to start a family. “My biology is still in healthy form,” laughs Rena. In the meantime, Rena is writing and producing a pre-colonial epic feature film based on the first historic novel written by a Maori, ‘Behind the Tattoo Face’, a difficult film which could take up to nine years to make. Rena will feature in ‘The Land Has Eyes’ – one of the four feature movies screening at the Hokianga Film Festival during Queen’s Birthday weekend.